AN ACCOMPLISHED PROFESSIONAL, YOU SHOULD BE WELL PLACED TO NAIL EVERY ASPECT OF JOB HUNTING. RIGHT? In the ideal world you would be as objective, focused and free of self-doubt as you are about a work project. But many people struggle to apply their knowledge and experience to themselves. Join our program and propel your job hunt with your own 'Board of Advisors' and cheer squad! Run online or face-to-face this workshop helps you set a strategy in place to set yourself up for success in your new role and continuously monitor whether your relevance and suitability for a future role is being maintained and / or enhanced in your current role. Lock this workshop into your calendar to 'automate' this habit. Set in place a systematic examination and objective review and articulation of your achievements, networking and professional development on a rolling basis each quarter. As re-structures abound, change becomes the new normal and AI, robotics and digitalisation dominate discussions on the 'Future of Work', challenging yourself to continually measure your relevance and marketability is the key to continuous employment in today's rapidly evolving world. Your CV is all about you. right? It's about your audience, often 3 separate audiences, one of them being an algorithim! When your experience and accomplishments span 15 years + how do you summarise what is unique about you? 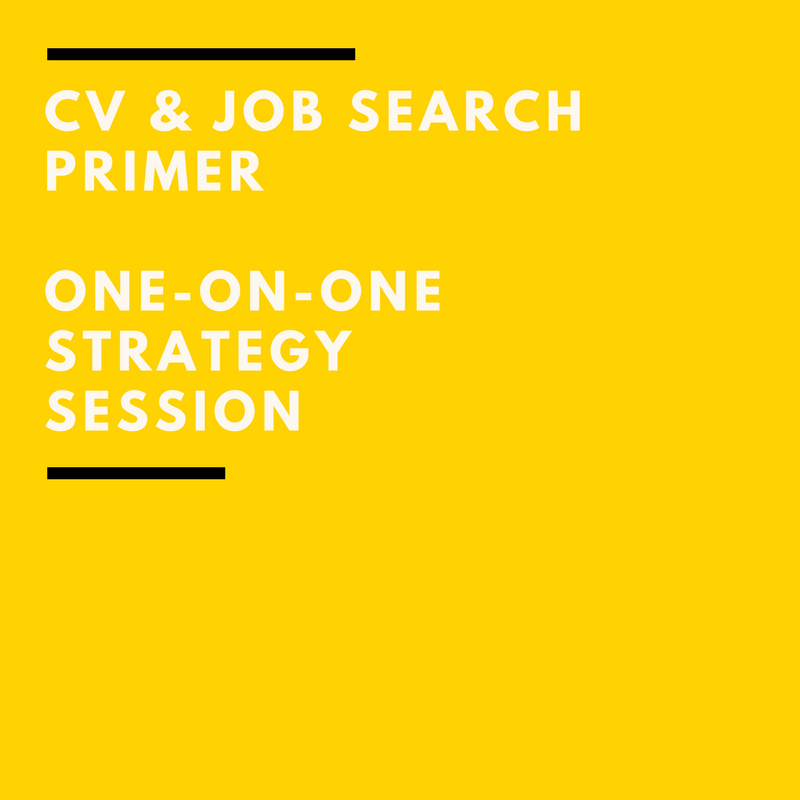 This workshop is not about actually writing your CV, it's about priming you to be able to write your CV (either yourself or by an expert) and plan your job search strategy. We work through a series of exercises to understand your target audience, what would 'wow' them and then identify what and how to message your accomplishments align with and capture the attention of your target audience. Why not just write my CV? The value of this approach is that you are clear on your strategic intent from the outset. It becomes much easier to capture that in your CV and articulate it in a clear and compelling way - because you understand what it is! Normally an evolutionary and iterative process this approach allows you to 'own' and have confidence in our own positioning. As with most of our programs, we expect that you know much of the theory. The benefit comes from the time and productivity gains that being coached and challenged by an objective third party bring. From the outset of your job search, you are seeing your CV and your personal narrative as an uninvolved, third party would. It is also an opportunity to talk through concerns and identify and troubleshoot elements that might trip up your confidence so you start your search unimpeded and clear on what you are looking for, what you have to offer and how this should be positioned in the market place. "A considered start lays the ground for an accelerated, productive and confident job search."